Our suites; The Landseer Suite, The Railton Suite and The Barry Suite are eponymously named after historic contributors to Trafalgar Square (a charming detail for those in the know), and each has a spectacular view of the landmark they created. The Barry Suite has an unrivalled view of Nelson’s Column, The Landseer Suite overlooks the square’s famous bronze Lions, while The Railton can’t fail to impress with a vista of the fountains, framed by London’s most iconic square. Decorated in a contemporary urban London style, this studio junior suite offers a spacious relaxing retreat with separate sitting area, for up to 2 guests with one king bed. The en-suite bathroom features a spacious walk-in shower and soaking tub along with Molton Brown toiletries. Enjoy complimentary WiFi, snacks and soft drinks from the mini bar along with multiple USB charge points and an array of additional amenities including a Nespresso Coffee machine, amenities bathrobes and mineral water make this room perfect for those who like to linger that little bit longer. Decorated in a contemporary urban London style offering skyline city views of London. A spacious relaxing retreat with a separate lounge area, this one bedroom suite is the perfect London bolthole for up to 2 guests. The en-suite bathroom features a spacious walk-in shower and soaking tub along with Molton Brown toiletries. Enjoy complimentary WiFi, snacks and soft drinks from the mini bar along with multiple USB charge points and an array of additional amenities including a Nespresso Coffee machine, amenities bathrobes and mineral water make this suite perfect for curling up after a long day of exploring or a night of entertaining. Contemporary elegance in abundance, this modern grand studio suite offers a relaxing retreat. The en-suite bathroom features a spacious walk-in shower and soaking tub along with Molton Brown toiletries. 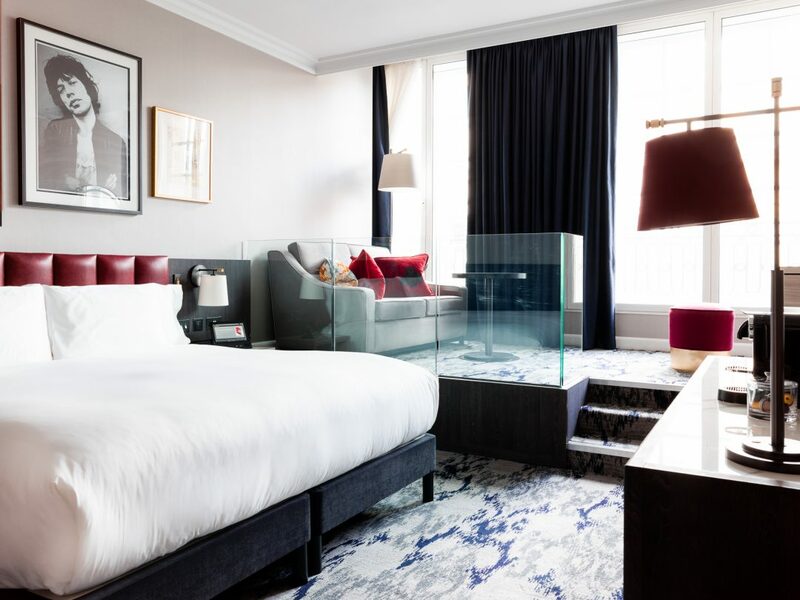 With breathtaking views overlooking Trafalgar Square, combining contemporary style with traditional comfort, this grand studio suite is the ultimate in Luxury London accommodation.The en-suite bathroom features a spacious walk-in shower and soaking tub along with Molton Brown toiletries. Our rooms celebrate modern British design with refined furnishings and bold colour splashes. We can cater for your every need, be that work, rest or play. Iconic wall art features the best of London’s music idols. Details such as in-room books and teas from the Tregothan estate share a distinctly British flavour. All rooms are decorated in a contemporary urban London style with an en-suite bathroom stocked with Molton Brown toiletries. An unforgettable experience comes as standard. This guest room offers a snug relaxing retreat for up to 2 guests. Enjoy complimentary WiFi, snacks and soft drinks from the mini bar along with multiple USB charge points and an array of additional amenities including a Nespresso Coffee machine, bathrobes and mineral water make this room perfect for those short city stays. This guest room offers a cosy relaxing retreat for up to 2 guests. Enjoy complimentary WiFi, snacks and soft drinks from the mini bar along with multiple USB charge points and an array of additional amenities including a Nespresso Coffee machine, amenities bathrobes and mineral water make this room perfect for those short city stays where a little more space goes a long way. This guest room offers a warm family escape for up to 2 adults and 2 children. The en-suite bathroom features a spacious walk-in shower and soaking tub. This guest room offers a spacious relaxing retreat for up to 2 guests. The en-suite bathroom features a spacious walk-in shower. This guest room offers the perfect city escape for friends and family alike offering two queen beds. The en-suite bathroom features a spacious walk-in shower and a soaking tub.